Palazzo delle Finanze, headquarters of the Ministry of Economy and Finances. 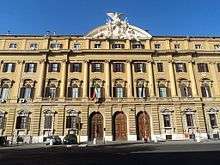 The Ministry of Economy and Finances (Italian: Ministero dell'Economia e delle Finanze, also known by the acronym MEF), is a ministry of the Italian government. It responsibilities include overseeing economic policy, public investments and spending. MEF's headquarters are located in the historic Palazzo delle Finanze. The current minister is Pier Carlo Padoan. ↑ "Coni Servizi SpA" (in Italian). Italian National Olympic Committee (CONI). Retrieved 22 March 2016.